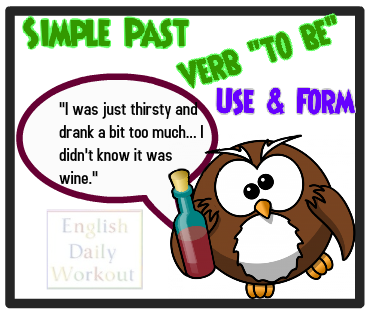 ﻿ English Daily Workout: Simple Past: Questions and Negative Statements with the Verb "to be"
Simple Past: Questions and Negative Statements with the Verb "to be"
English Grammar Lesson and Exercise on the Simple Past: How to Make Questions and Negative Statements with verb "TO BE"
Was I not awake? Wasn't I awake? Were they not ready? Weren't they ready? I was awake. I was awake, wasn't I? They were ready. They were ready, weren't they? Rewrite the following affirmative statements as questions, negative statements, negative questions without contractions, negative questions with contractions, and affirmative statements followed by negative tag questions.